We’d love your help. 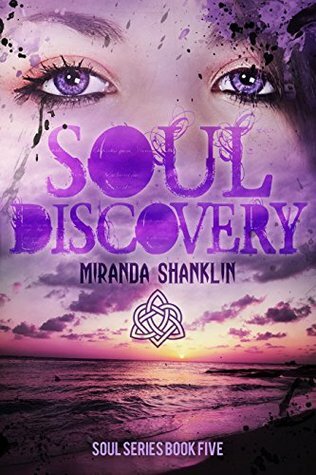 Let us know what’s wrong with this preview of Soul Discovery by Miranda Shanklin. Annisa and her group have finally made it to the point where they don’t have to watch over their shoulders for someone trying to destroy them. They have put together a system that allows the other realms access to our realm and they are still able to keep an eye on them. Will the faeries and the trolls outsmart them and accomplish their goal? Will Annisa and the others be Annisa and her group have finally made it to the point where they don’t have to watch over their shoulders for someone trying to destroy them. They have put together a system that allows the other realms access to our realm and they are still able to keep an eye on them. Will the faeries and the trolls outsmart them and accomplish their goal? Will Annisa and the others be able to obtain enough support to keep their realm intact? Or will the faeries and trolls destroy all that this realm stands for? Chase and Annisa have taken on a task that they are not sure if they can accomplish without the help of the others who have to stay behind and keep things running smoothly at the passageways. They will have to be creative and convincing to pull this one off and create a truce between all the realms. To ask other readers questions about Soul Discovery, please sign up. This is the final book in the Soul Saver series by Miranda Shanklin and you will not be disappointed. With the passages to the other realms open for travel, the gang is hard at work making sure visiting creatures are respecting the hosts of the realms. They begin to think that the faeries and trolls might be up to something and they set off to figure it out. Annisa and Chase decide to set off on their own to visit the magickal creatures they had only heard about up until now as they work to make This is the final book in the Soul Saver series by Miranda Shanklin and you will not be disappointed. With the passages to the other realms open for travel, the gang is hard at work making sure visiting creatures are respecting the hosts of the realms. They begin to think that the faeries and trolls might be up to something and they set off to figure it out. Annisa and Chase decide to set off on their own to visit the magickal creatures they had only heard about up until now as they work to make sure their realm; and all the others they have sworn to protect, remain safe. The different magickal creatures we are introduced to make this book my favourite in the series. There were surprises and new characters that I absolutely LOVED as they came into play and I found myself wishing for more when it came to them. Miranda did a great job rounding out the ending leaving me satisfied with the complete story. If you haven't picked up book 1 in the soul saver series and are into paranormal NA I would recommend this series to you. In this action packed final adventure, Annissa and her friends have opened the portals to allow the trolls, fairies, elves and goblins to visit the realm to study and learn about what makes this realm different from the others. Annissa senses something is amiss and sure enough, the trolls and fairies have teamed up to try and take over the realm. Its up to Annissa and her friends to stop them before anything bad can happen. Together, Annissa and Chase go off to warn the other creatures in the re In this action packed final adventure, Annissa and her friends have opened the portals to allow the trolls, fairies, elves and goblins to visit the realm to study and learn about what makes this realm different from the others. Annissa senses something is amiss and sure enough, the trolls and fairies have teamed up to try and take over the realm. Its up to Annissa and her friends to stop them before anything bad can happen. Together, Annissa and Chase go off to warn the other creatures in the realm about the plans that the fairies and trolls have put in place, before any disaster happens. Hated to see this book end. I couldn't get the Kindle to turn anymore pages.I was lucky enough to read on and on with all 5 of the books, given as gifts.. I got so engrossed in the stories and the lives of all involved, I feel a sadness. I love Miranda and hope she does well with her future writings. She deserves it. I loved this whole series! Every book in this series was amazing! You will not be disappointed. I can't even give a proper review without giving away a bunch of spoilers go get the series you will see what I'm talking about!!! !